Asus' fetish with the Padfone continues at the Mobile World Congress, as it has been launching at least one device of this style since the 2012 edition of MWC. 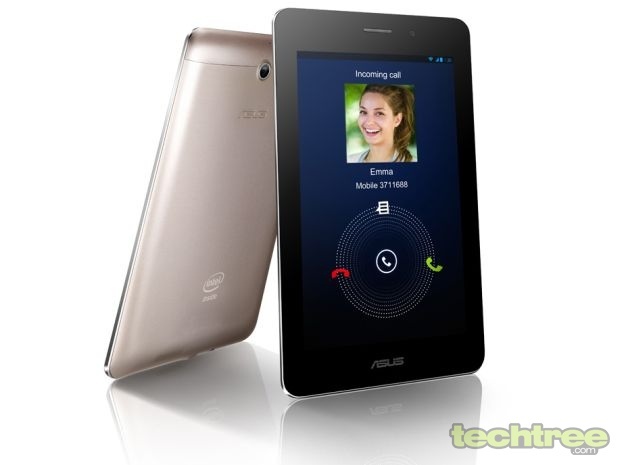 This year, alongside the Padfone Infinity, Asus has launched a 7" Fonepad today at MWC 2013. The tablet, which supports voice calling, will run Android 4.1 out of the box. 7 inch, 10-point multi-touch IPS screen with pixel dimensions of 1280x800. Android 4.1 (Jelly Bean) OS. 3G voice calling and data support. 1.2 MP front facing camera. 3 MP rear camera (on select models). Intel Atom Z2420 processor with 1 GB RAM. 16 GB / 32 GB internal storage; microSD card support. Available Colours: Titanium Grey and Champagne Gold. While nothing has been said about the battery's capacity, the release does mention that the tablet is estimated to have enough juice to last for up to 9 hours. The 16 GB variant of the tablet is expected to start retailing in the US by March with a $249 (Rs 13,600) price tag and in the UK by late Q2 2013 for £179 (Rs 12,800). Pricing details, global availability and complete specifications are yet to be confirmed.